The art of acupuncture is central to my practice. Contemporary needles are sterile, single-use and surgical steel - about the size of a cat's whisker. They are inserted both locally and distally to treat a wide range of conditions (see Treating Conditions). Sensations vary from barely noticeable to lively and migrating to somewhat dull and heavy. Needles may be applied to the ears as well as points along the channels (also known as meridians). Moxa or Chinese mugwort is a fragrant herb that moves qi and builds energy in the body. It's a close relative of many artemesias found in this country. Moxa has a strong and vital smell, sometimes confused with incense, sage or other smoke. 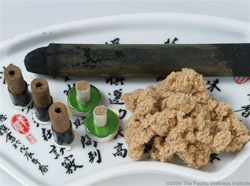 This picture shows a typical moxa stick being used in treatment. Moxa comes in many forms and can be used in in countless other ways. Among them are warm moxa pillows, loose moxa cones and moxa burned on the end of a needle to direct warmth and energy deep into the body. Moxa is a favorite of many people and is often a requested treatment. This scraping method is widely used for releasing pain and stagnation. There has been quite a revival of this technique in recent years as a simple means of liberating stuck energy from painful spots and improving circulation. PubMed, an arm of the National Institute of Health defines it thusly: "Gua Sha is a therapeutic surface frictioning that intentionally raises transitory petechiae and ecchymosis, is a traditional East Asian healing technique also known as cao gio, coining, scraping, and spooning." The red or purple that shows up on the skin during gua sha is evidence that the technique is indicated; no redness after a short period of time means no need to keep treating. Cupping has been used for thousands of years in all parts of the world, from Siberia to the Islands. Its rich and vast history speaks to its efficacy. 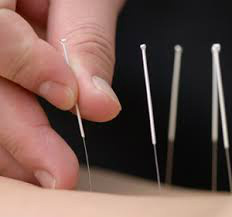 Used for conditions as diverse as lung congestion to muscular tightness, spasm and pain, it is often employed as an adjunct to needling. Where there is static blood, lymph, cellular debris, and toxins present in the body, cupping can leave marks. These indicate that the stagnation or disease has been moved from the deeper tissue layers to the surface. Each session of cupping in a particular area tends to leave lighter marks until little or no mark will appear.